Keywords: Pulmonary arterial hypertension, Noncoding RNA, Drugs, miRNA, LncRNA, Network. 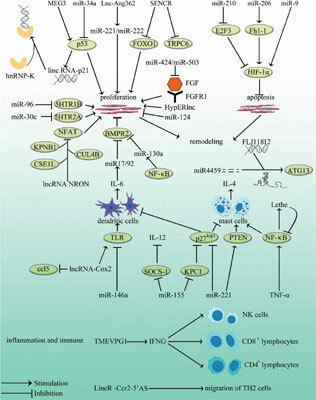 Keywords:Pulmonary arterial hypertension, Noncoding RNA, Drugs, miRNA, LncRNA, Network. Abstract:Pulmonary arterial hypertension (PAH) is a devastating disease without effective drugs available for its treatment. An in-depth exploration of the pathogenesis of PAH, as well as inquiry into potential therapeutic targets, remains an urgent issue. Non-coding RNAs (ncRNAs) have arisen as key players in malignant tumors, cardiovascular diseases and more recently in PAH progression and development. Network pharmacology is a new discipline based on system biology, which can predict potential therapeutic targets in diseases regulated by multiple genes. In this review, we discuss the current knowledge of ncRNAs and network pharmacology regulated genes involved in PAH, as well as the search for potential drug targets for PAH.